Wright State University is tied to a history of exceptional ingenuity and courage thanks to our namesakes, the Wright brothers. Orville and Wilbur Wright were not pilots. They were not aviators. They were bicycle shop operators. They were self-trained engineers, mathematicians, physicists, and philosophers. They were raised to ask questions, inspired to think beyond the known, and encouraged to dream. Through their passion and undeterred efforts, and without the extravagant support afforded to others seeking a similar feat, they taught the world to balance in thin air, perfecting their flying techniques in a field near Wright State. Inspired by the pioneering spirit of the Wright brothers, Wright State intentionally creates pathways to success for its students through diverse educational opportunities. 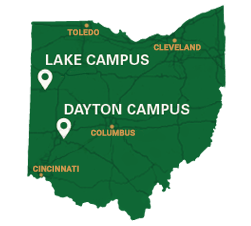 By offering exceptional programs at an exceptional value, Wright State puts quality education within reach. We meet students where they are, then join them on a journey to where they want to go. If two bicycle shop owners can solve one of mankind's biggest challenges, then we, too, can achieve anything. We are not afraid to try new things, and, just as importantly, we're not afraid to fail. This determination, this grit, this fearlessness, this desire for forward progress—it's all part of the Wright State brand. More than a name, logo, or color, our brand is a feeling…a promise…a belief. A brand is the message we present and exhibit, within our walls and to the outside world. Our brand is everything we say and do, and how we say and do it. 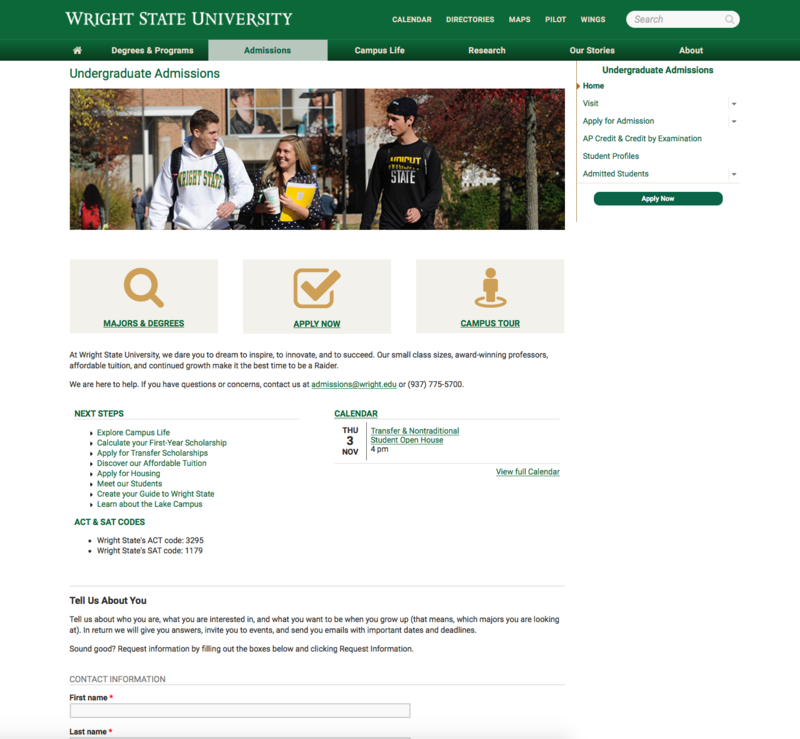 Download a PDF of the Wright State University Brandbook and read through the guidelines to understand how to successfully use the official logos, wordmarks, colors, etc. Please contact the Office of Marketing if you have any questions about proper usage of these assets, or have a special request for any subsidiary logos. 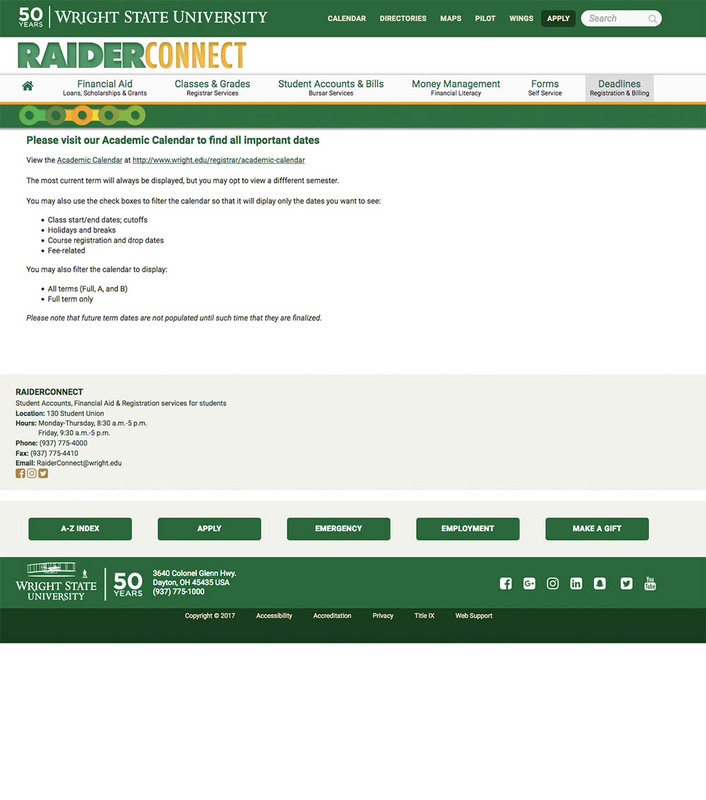 The RaiderConnect website is an integral part of the process for incoming student and current students enrollment services. 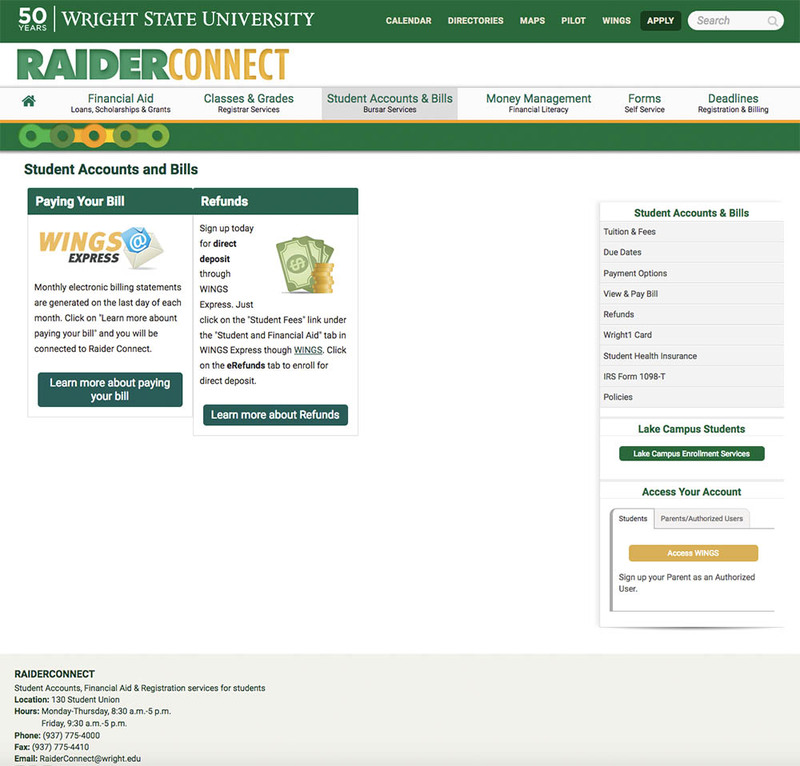 RaiderConnect is a one-stop resource for student registration, bill payment, and financial aid. With such a large portion of our campus using this website on a regular basis, it is imperative we continue to iterate and improve the site for all target audiences. 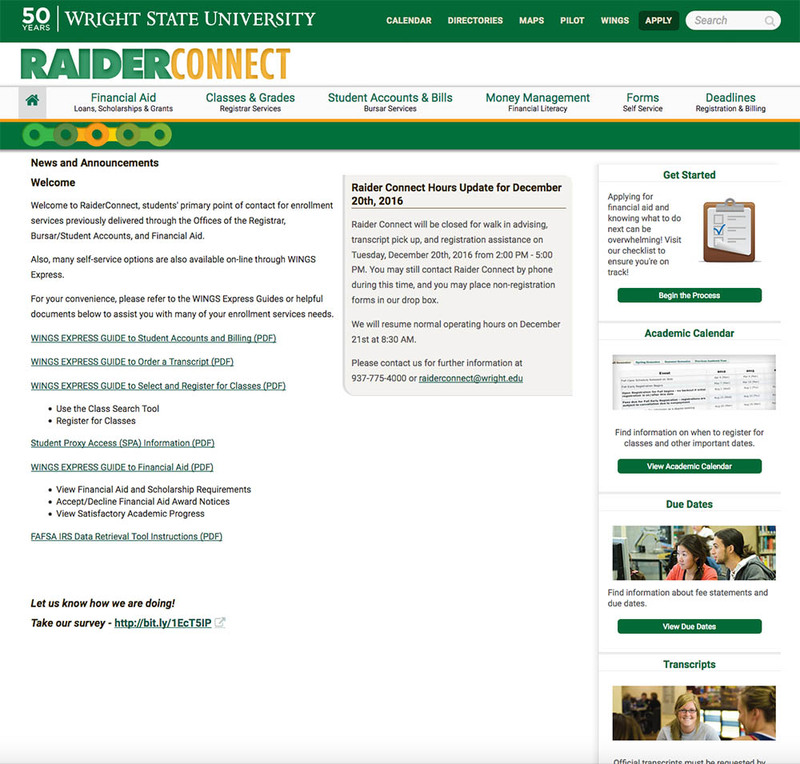 With the assistance of the Enrollment Management Division, we have been gathering feedback using a few different User Experience (UX) techniques over the last year. For the RaiderConnect site, we used a technique called "card sorting" to help improve our information architecture on the site. Card sorting is a technique that allows the user to sort data into different groupings or create their own new groupings. This data is then used to improve the navigation and content organization of the site. 217 future Raiders who visited campus participated in a card sorting exercise which resulted in many changes from the previous version of the site. Based on this data, a change to the navigation updates Classes and Grades on the previous site into two new terms Registration and Grades and Transcripts. 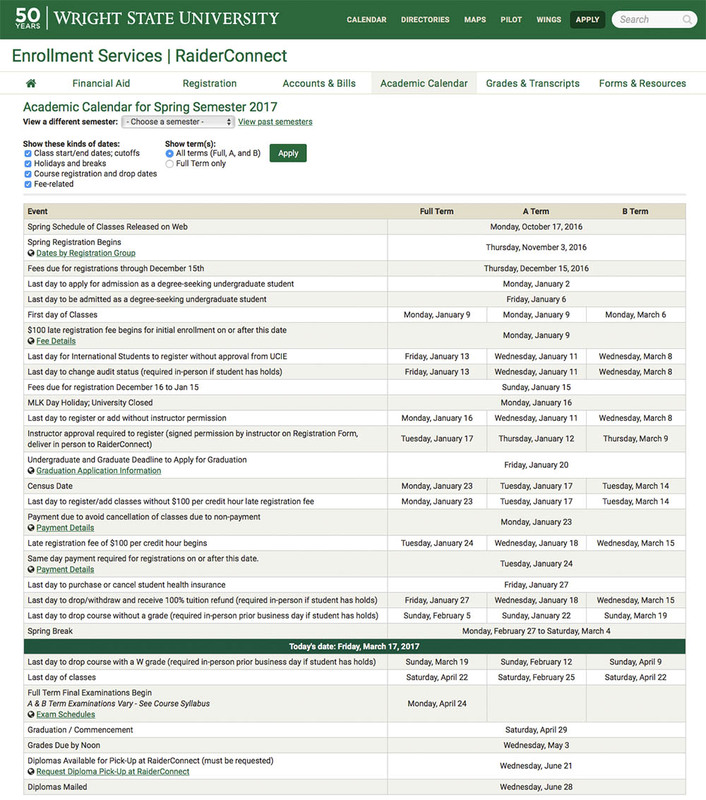 The navigation item named Deadlines was changed to Academic Calendar to help highlight this highly sought-after content. Many other changes to information architecture and content were based off the data provided by the card sort. The resulting page is more user-friendly and much cleaner in appearance, especially on mobile. The Theatre Dance and Motion Pictures department site was one of the first sites migrited to our content management system in 2012. With all other department sites now living on their respective college subdomains it was time to move Theatre Dance and Motion Pictures to its rightful home while also providing a much needed refresh. 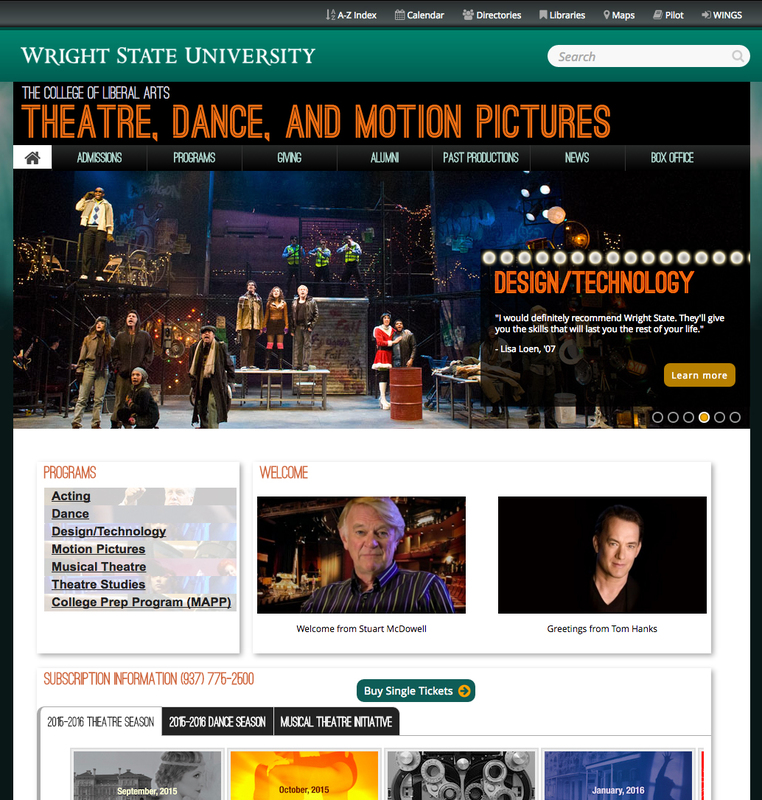 The Theatre, Dance and Motion Pictures website was one of the first sites built in our Drupal platform in 2011. Since that time our brand, mobile, programmatic and esthetic standards have evolved greatly. 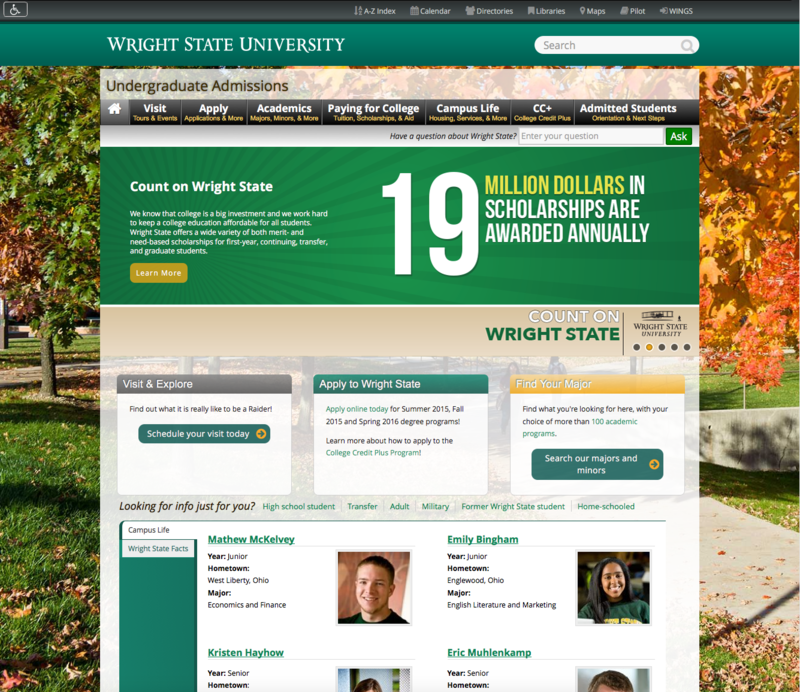 This site was originally built on www.wright.edu and not its respective college specific domain (liberal-arts.wright.edu) which is now the standard for all academic departments across the university. A large portion of our planning also revolved around minimizing the effort and complexity for users with the college to be able to edit the site, especially the performances section which in its original state could be quite complicated. There was a lot of interest in making the pages more visually appealing with large photography. 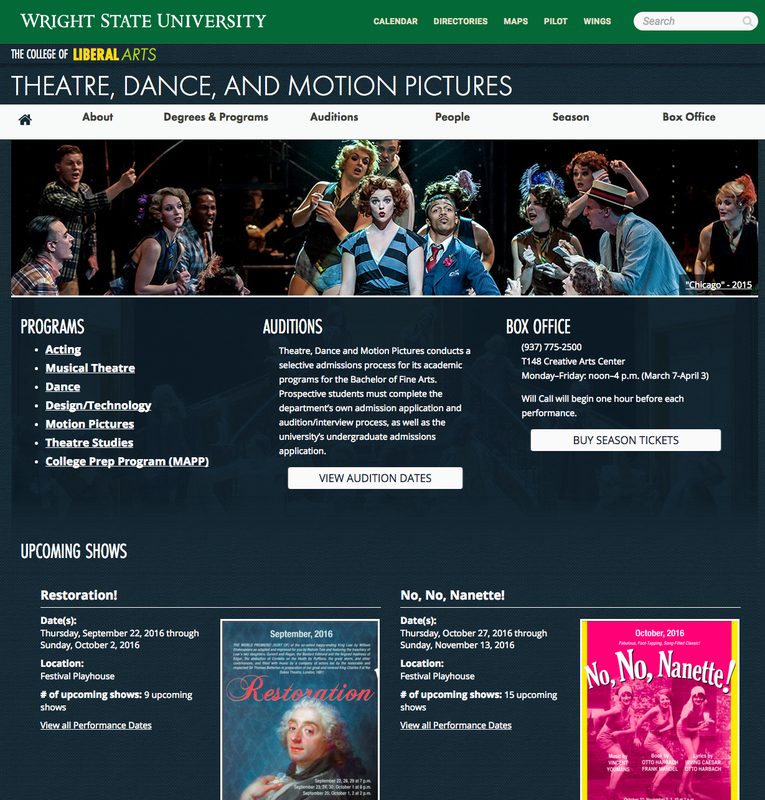 The new Theatre, Dance and Motion Pictures website was built with collaboration between the academic department and the Office of Marketing on the college domain. The new site features a streamlined in brand appearance and refined navigation. Many issues the previous site had while being viewed on mobile have been addressed. Large photography was added throughout the site, with special attention paid to the academic programs and performance sections of the site. A new content type was built that allows for more granular control of the presentation of the details of each performance. Performances now include fielded data for show times, ticket availability, location, promotional materials, and an image gallery. The new performances content type was built to be reusable for the Robert and Elaine Stein Galleries section of the College of Liberal Arts which has similar needs and a current lack of refinement. Undergraduate Admissions was the first site moved into our content management system in 2011 and was long overdue for an update. Align with new branding colors, fonts, etc. 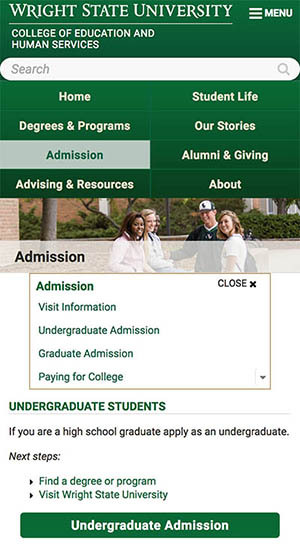 The Undergraduate Admissions website rebuild was directly aligned with the rebuild of the university homepage. This allowed for a high level of integration and focus on prospective students during the rebuild as a whole. 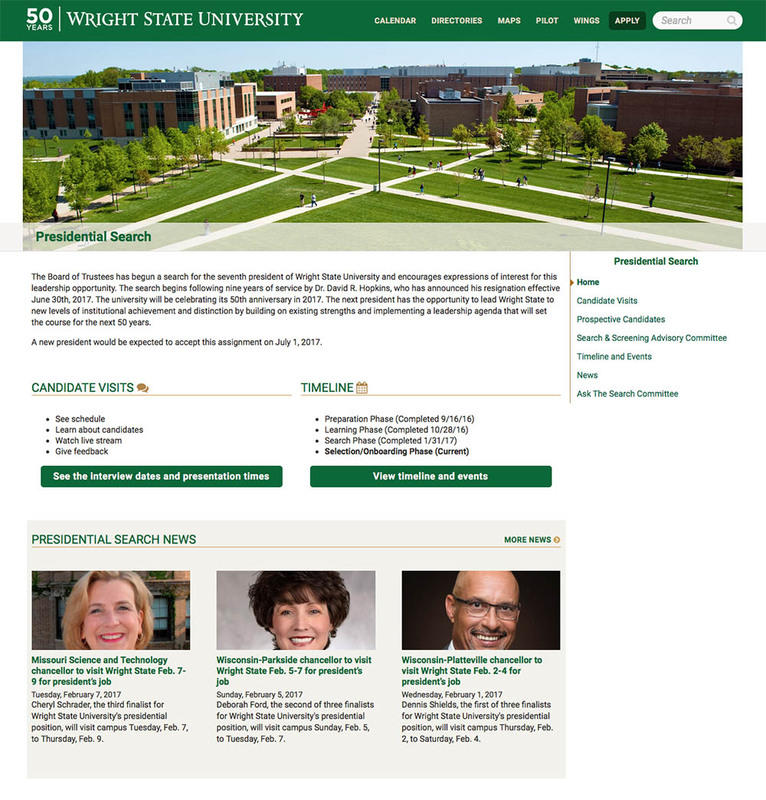 The Office of Marketing web team worked on the redesign for a year, involving Wright State colleges, departments and units, the Division of Enrollment Management, the administration, and students in the process. 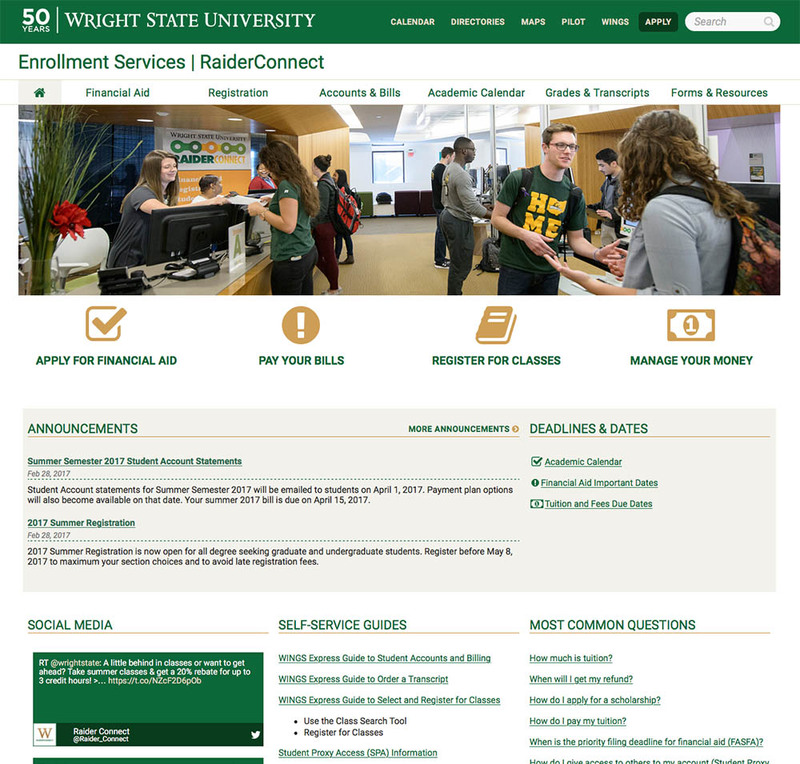 The new Undergraduate Admissions webpages offer an improved user experience for prospective students. Content, images, graphics, and navigation have all been selected with potential incoming students in mind. For instance, content on the main admissions webpage is now organized by audience, making it easier for visitors to find the information they are looking for and get to Undergraduate Admissions quickly. 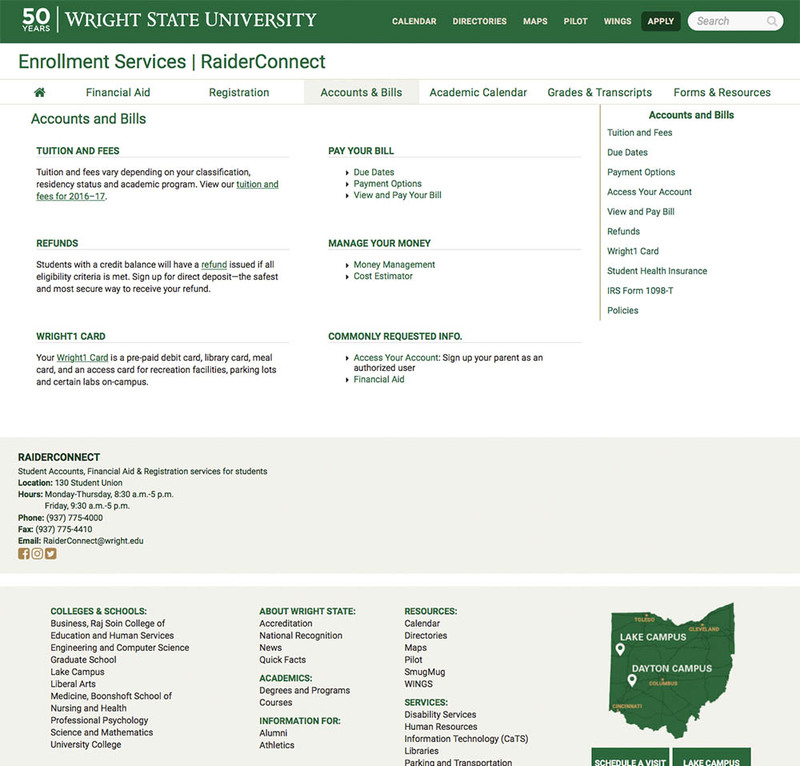 Undergraduate admissions webpages were redesigned and built to match the university’s new customer relationship management (CRM) system, a streamlined admissions process that includes a single application for all programs except the M.D. degree. With the CRM in place, analytics will track emails and other marketing efforts, as well as the website’s performance. This process will drive further iterations of the site and refine the admissions process.